Kalman, Harold D.. "Airport Architecture". The Canadian Encyclopedia, 30 June 2016, Historica Canada. https://www.thecanadianencyclopedia.ca/en/article/airport-architecture. Accessed 21 April 2019. The federal Air Board Act of 1919 made provision for the construction of airports (also called aerodromes or air harbours), but for many years airplanes used flying fields that had few facilities. In 1927 the federal government provided incentives for private flying clubs to develop airports with hangars (large, wide-span structures built to accommodate aircraft and for maintenance) and workshops. Winnipeg's Stevenson Aerodrome, for example, which opened in 1928, was the airfield of the Winnipeg Flying Club. The principal building was a simple rectangular structure; by 1930 Canadian Airways Ltd replaced it with a larger hangar covered by an arched roof and with a "passenger station" to the side for the waiting room and offices - the typical airport design of the early 1930s. A new wave of construction was inspired by the formation of the Department of Transport in 1937 and the inauguration of Trans-Canada Airlines (now Air Canada) in 1937. Dorval Airport (1940-41) near Montréal represented the new breed of airports. The passenger terminal, now separate from the hangar, featured a ticket lobby and general waiting area, not unlike the familiar arrangement of a railway station. Passengers left the terminal and walked onto the apron to board their airplanes. The control tower was generally integrated into the terminal building. The Department of Transport introduced the severe International Style in its airports of the 1950s, as did the Department of Public Works with other public buildings. Two of the more distinguished were Ottawa International Airport (Gilleland and Strutt, with Department of Transport architect W.A. Ramsay, 1955-60), with passenger-handling areas located to either side of a central waiting area and a control tower above; and the larger Winnipeg International Airport (Green, Blankstein and Russell, with W.A. Ramsay, 1960-64). Montréal International Airport-Dorval (Illsley, Templeton, Archibald, and Larose and Larose, 1956-60; now Pierre Elliot Trudeau International Airport) had, in addition to "fingers" against which the airplanes docked, a remote quay linked to the main terminal by an underground moving sidewalk. The 1960s and 1970s encouraged experiments in improving passenger convenience. Terminal 1 at Toronto-Lester B. Pearson International Airport (John B. Parkin Associates, with W.A. Ramsay, 1962-64), the only one of four intended identical "aeroquays" to be built, was circular in plan, to provide the maximum perimeter space for aircraft while offering a short walk for passengers. A large parking garage was an integral component, and the administration building and control tower were separate structures. Mirabel Airport (Papineau, Gérin-Lajoie, LeBlanc, Edwards, 1970-75; passenger service discontinued 2004) near Montréal is shallow in plan so that passengers needed to walk only a short distance to the departure dock to board wheeled passenger transfer vehicles that transported them to the airplanes. Vancouver International Airport (Thompson, Berwick and Pratt, 1968; now the Domestic Terminal) and Calgary International Airport (Stevenson, Raines, Barret, Hutton, Seton and Partners, 1977) have a more conventional plan, with a 3-storey central terminal area leading to fingers at either side. The Calgary terminal was built to accommodate future expansion. The somewhat futuristic Vancouver design broke away from the international style and set the trend for bold and often curvilinear solutions. These and other airports have been subject to a rash of modifications and additions to accommodate larger aircraft, increased flights, and ever more complex technical requirements. Most incorporate security barriers, remote lounges, loading bridges, customs and immigration areas, and commercial concessions. When added to earlier airports, the original clarity of their design was obscured. At Ottawa International Airport (renovations by Murray and Murray, Griffiths and Rankin, 1984-87; new terminal by Brisbin Brook Benyon and Architectura, 2002-03) the architects imposed an assertive new design, whereas at Winnipeg International Airport (The IKOY Partnership, 1985-87), the new work carefully respected the original International Style. Both airports include significant parking structures. The governance and design of airports changed with the federal government's decision to relinquish control of them. Between 1992 and 1997, community-based, self-financing, not-for-profit corporations took over management and operation of Canada's airports from the Department of Transport under long-term leases. Most have undertaken extensive capital improvements, supplementing revenues from landing, terminal, and parking fees by levying airport improvement fees and, most importantly, by providing passengers and staff with extensive - and lucrative - retail and service facilities. 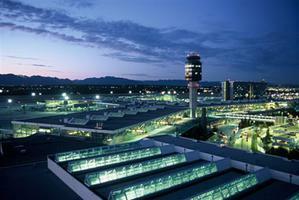 The Vancouver International Airport Authority, formed in 1992, led the way. The new International Terminal (Architectura with HNTB Corporation, 1994-96, and subsequent additions) features high ceilings, glazed walls, exposed metal structural elements, elevated walkways with extensive views inside and out, and an impressive collection of works by BC First Nations artists. The Domestic Terminal (1968) has been extensively renovated (Kasian Kennedy), with a large departures area the central feature. The two terminals together have more than 110 concessions, including shops, restaurants, health-care clinics, other services, and a 392-room hotel, becoming a significant shopping centre in its own right. Airports at smaller cities have similarly undergone continual expansion and replacement. Saskatoon Airport began in 1928 as the home of a flying club, and grew in the 1930s and 1940s with the arrival first of commercial and then military air service. In 1955 the Department of Transport built a Modernist terminal, whose successful design was later reused by the Department of Transport at Québec and Windsor. It in turn was replaced in 1975 (Holiday-Scott), and has recently been expanded as John G. Diefenbaker International Airport (Kindrachuk Agrey, 2000-02), with a curved and extensively glazed exterior design, and the interior spaces are far more spacious than before. The Greater Toronto Airports Authority has leveraged the new sources of revenue to fund a $4.4 billion redevelopment of Pearson International Airport. New Terminal 1 (Airports Architects Canada, a joint venture of Skidmore Owings & Merrill, Adamson Associates, and Moshe Safdie Associates, begun 1999, Phase 1 completed 2004), described as Canada's largest construction project, is a tour de force that displays a bold, curvilinear form with large spaces and long, arched roof spans - a geometry reminiscent of the 1960s building it replaced. Similar to the Vancouver terminal, with light and spacious interiors, finished in white, soft greys and brushed aluminum and punctuated with high-tech details, it has a very conspicuous retail presence. Ironically, the reduction in passenger travel that followed the terrorist attacks of 11 September, 2001, the SARS outbreak of 2003, and the consequent financial crises faced by Air Canada and other major carriers, threaten the financial viability of the large, new Toronto and Vancouver airports. T.M. McGrath, History of Canadian Airports (1992). The Royal Architectural Institute of CanadaRAIC is the voice for architecture and its practice in Canada. It provides the national framework for the development and recognition of architectural excellence. Check out information about career opportunities in architecture and the "Professional Interest" section for a multimedia feature about health care architecture.